How to Pamper Your Dogs to Be "Best in Show"
Something that you may not know about me is that I used to show dogs. It was a brief stint when I was in 8th and 9th grade and I showed a beautiful Irish Setter named Rosie. Dog showing was not for me but I did love spending time with the dog and have grown up being a dog lover. My mom raised us to be obsessed with dogs and to treat them like people. 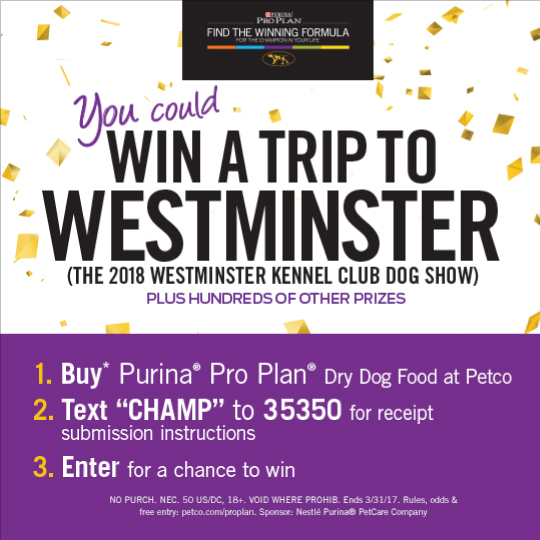 ***Keep reading to enter a sweepstakes to win tickets to the 2018 Westminster dog show! You may notice that I talk a little bit crazy about my dogs like how Jaxen keeps me in shape by taking me on walks, Ava runs our household and is the #1 boss and how they are both our best friends. We are true dog lovers. I am very close with my family and we often all get together. My mom has 3 dogs, I have 2 dogs and my brother has 2 dogs. It is crazy when we all get together!! Luckily, 4 of the dogs are small dachshunds so they don't take up too much space (though their bark shows that they are bigger than their 12 pound frames shows haha). Every year growing up, we celebrated watching the Westminster dog show with a big party at home. It is a two day event on TV and we would always watch both days. My mom is very into the dog shows and enjoys going to see different local dog shows just to pet all the dogs. I remember my mom having different themed parties for the Westminster which is a fun thing to do in the dead of winter. Ava giving Jaxen the typical Ava glare. I always talk about how Jaxen likes to walk and now, my daughter Adalyn loves to walk him so it is the perfect thing for us to do after work. Adalyn can walk about 1 mile and knows to tell Jaxen to stay on the sidewalk, don't pull, etc. It is so adorable!! I can honestly see a difference in Jaxen's mood when he walks compared to when he doesn't. He loves exercise. I am lucky because with my dog's short hair, I do not have to do much with them to groom them. I just cut their nails and brush their teeth. They don't really like it but they are not too bad about it either. Dogs just want to be loved so that is the best thing to give them. It can be crazy during the day when Adalyn is running around but after she goes to bed, that is when our dogs love being by us and want to be held, petted, etc. Adalyn loves holding Jaxen (Ava can be mean to her) so we let her give him hugs and lots of love. We love the Purina® Pro Plan® dog food from PetCo which is Nutrition that Performs®. It is a quality dog food that has fueled the last 10 Westminster champions. We like the Purina® Pro Plan® Savor dog food which each variety has real meat, poultry or fish as the number one ingredient. They have both crunchy and tender meaty pieces- my dogs love it! Adalyn loved going to PetCo so much!! We got to see two dogs, 4 cats, 2 bunnies, a turtle and some other animals while we were there. She freaked out! She didn't understand why we could not hold them all though. Haha! Also, check out this cute videos of the people from the Westminster and some of the dogs that are shown there. I love hearing the stories about them and watching any kind of dog commercials! Too cute, your daughter and fur babies are great together. I have 6 grandchildren and 2 dogs. Our playground is within walking distance. We have a blast.